Even among the youngest readers, demand for digital formats is higher than ever. But switching from the printed page to apps, games, and VR formats is a huge financial challenge, especially for smaller publishing houses. Pippi Longstocking, Little Tiger and Little Bear, Pettson and Findus, Rapunzel, the Little Polar Bear and Cinderella: the list of characters from beloved fairy tales, children’s books and comics who have slipped out of the book, film and audiobook to make their way into the digital universe is practically never ending. Educational games for PCs and gaming consoles, apps for smartphones and tablets and transmedia and crossmedia products that link analogue and digital formats have long been an integral to the children’s and young adult literature repertoire. Publishers and media houses are doing their utmost to respond to the opportunities and challenges of digitalisation. Publishers like Beltz & Gelberg, Carlsen, Coppenrath, Knesebeck, mixtvision, Oetinger, Ravensburger and Tulipan are all exploring how to offer readers and customers more than just the by-now obligatory e-version of their books. Beloved literary characters and their stories serve as the jumping off point for exciting or thrilling adventures in games played on consoles and PCs or through an app. Sven Nordqvist’s inveterate tinkerer Pettson has abandoned the illustrated page to offer children brain teasers, while Eric Carle’s Very Hungry Caterpillar, Eva Muszyniski and Karsten Teich’s Cowboy Klaus and Alexandra Helmig and Timo Becker’s Kosmo und Klax have become the heroes of mini games that encourage young players to collect things and solve problems. These well-known characters are helping children learn while they play, promoting critical thinking, and improving motor skills and concentration. Updating the fairy tale: Cinderella has danced her way into the interactive, digital age. | Photo: © Marlene Zöhrer Popular figures from picture and other children’s books also pop up in educational games to improve math and reading skills, or introduce children to a foreign language. These include German crowd-pleasers like Martin Baltscheit’s learning Lion (the Löwe series), Princess Lillifee, the small, green, smelly Olchis and every girl’s best friend Conni. Adaptations of Grimm’s and other fairy tales, The Great Word Factory, Jutta Bauer’s little bear Emma, The Trip to Panama and Pippi Longstocking take the stories told in pictures and words on the pages of a book and transform them for the new medium. These apps often consciously depart from the actual storyline to integrate playful and interactive elements and mini games. There are also interactive stories for children and teens only available in a digital format and crossmedia products that combine books with apps. With Its LeYo! series -- now the Carlsen Clever series -- The Carlsen Verlag has added augmented and virtual reality (AR or VR) to picture and non-fiction books. The app enhances the printed book by adding extra content via smartphone or tablet. This same idea inspired the app stories released by Knesebeck and the picture books from various publishers available as a “SuperBuch” or super book. Was ist denn hier passiert? (What happened here?) by Julia Neuhaus and Till Penzek (Tulipan publishers) takes a different approach. Twelve curious and slightly odd picture-book scenes include a QR code which takes readers to short animations that explain the stories behind the pictures. This combination of analogue and digital media adds considerable entertainment value. The range available for pre-school and elementary-school children is impressive and richly varied, but not all publishers of children’s and young adult books have joined in the digital dance circle. Some oppose digital products on principle, while others simply cannot afford the hefty price tag. Small and very small publishing houses often lack the financial cushion needed to develop an app to accompany a picture book. Even on a bare-bones budget, it takes a five-figure advance to create and market a functioning, aesthetically pleasing and conceptually well-integrated product. Given that the final product will sell for no more than 3.49 euros in the app store, this is quite a financial risk. An app developed and produced for 50,000 euros (a figure that includes around 20 work packages from project idea and storyline development, animation, sound and voice recording to game design, actual programming, testing and release in the right shops) would have to be downloaded at least 25,126 times at 1.99 euros each before the producers and publishers see even one red cent of return on their investment. Tulipan publishing house employs QR codes to add content to its picture books. 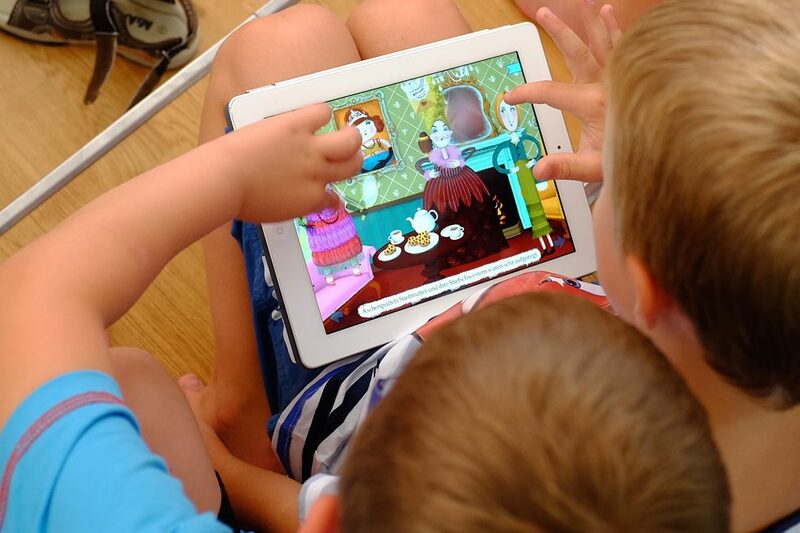 | Photo: © Tulipan Verlag And digital games, educational packages and interactive stories for children face another marketing hurdle: there is currently no really good way to present and sell them. At the moment, there is no single platform that gives parents, teachers and intermediaries quick and easy access to good and appropriate children’s apps. This makes it that much harder to publishers to offer the apps they have sunk so much money and time into in a way that could guarantee their success. Copyright: Goethe-Institut, Marlene Zöhrer. This work is licensed under a Creative Commons Attribution – Share Alike 3.0 Germany license.